I remember the day when I started gaming with the older kids. I was young and obnoxious, and to my everlasting shame I actually asked if I could play a dragon. The GM was cool though, and since it was a high-level campaign he actually allowed it. I had no idea how the rules worked, what good role playing looked like, or whether they’d invite me back for more than a single session. But when the dice clattered across that rec-room table, and when I scored my first critical hit as a power attacking gold dragon, and when my fellow adventurers cheered my efforts… The phrase “childish glee” about sums it up. I was 24 years old. It was Laurel’s dad’s group, and the cool older kids were well into their 50s. Although I came to gaming late in life, I never quite forgot that feeling of being accepted into a long-established group. They were patient with my inexperience. They explained how the rules worked, and then they re-explained it when I got confused. They even incorporated a few of my crackpot ideas into the game (My dragon is from an ancient civilization buried beneath your setting! You’ve never heard of it!). I was nobody’s idea of the perfect player, but they allowed me into the group and worked me into the story. I’m still gaming with those guys to this day. That’s my story then, but what about yours? What was it like when you started gaming? Were you ever anyone’s “annoying little brother” asking for a chance to chuck dice with the big kids? Or were you that patient soul trying to deal with the obnoxious noob? How’d it go? I also started with D&D/Pathfinder pretty late (22, I think), but that is where the similarities stop. 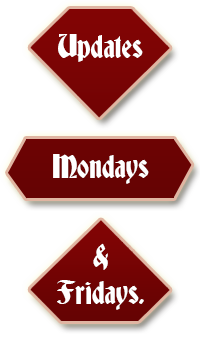 I was quite the opposite – while I waited for a game on roll20 and my not so friendly gaming store, I went across the 3.5 players handbook, DM’s guide, monster manual. I was pretty much thinking about how to min-max before I’d rolled my first d20. Luckily, the DM was very adventure oriented, so big numbers were quickly left in the back of my mind. Actually, there is one more similarty. I was looking through Races of the Dragon as well at the time, the dragonborn of Bahamut specifically, so I suppose I also wanted to be a dragon. I find that there’s this weird race with myself when I try to learn a new TRPG. I hustle as fast as I can to get all the numbers in my head, then I try to make them disappear. The goal is to internalize the numbers so I don’t have to think about them, but have more of an instinctual sense of them. That way I can still “be a viable build” without having to dwell on it. I started playing D&D in 3.5, fresh from years of endless character optimization in Neverwinter Nights. I was the consummate power gamer, far more concerned with build than RP. However, while Neverwinter Nights has D&D guts that left me familiar with all of the mechanical concepts of 3.5, it is a very different game overall. I was extremely confused by the concept that in D&D, your characters would be doing all kinds of things besides accepting quests, exploring dungeons, and fighting monsters, and that indeed those could all actually be but small aspects of the game. Furthermore, the concept that one could stay at level 1 for an entire summer, instead of maybe 30 minutes like in NWN, completely threw me for a loop. As such, I was completely out of my element. My first Rogue, fresh from the Rogue’s Guild (so lame) and ready for a new life of adventuring, introduced himself in a retrospectively cringe-inducing and meta manner, and then promptly got mauled to death by a dire rat in his very first combat while trying to be the tacticool dual wielder fantasy rogue. A bit of DM fiat brought him back, but he still never made it out of level 1. RIP. Fast forward to the present day, and I always try to make a solid personality for each character, even if I have a pretty standard formula of half personal attributes and half pop culture amalgamations. I also try to make my characters versatile generalists rather than specialists, because I feel that such a character gets to be involved in as many encounters (combat and otherwise) as possible. I tend to value survival capability over damage dealt, although the two sometimes go hand in hand. I do still play Rogues entirely too often, though. My older brothers are significantly older- graduating high school while I was in kindergarten older. So many a weekend with my bio father meant many a weekend tagging along while they played … In 86/87. Mostly, I had no idea wtf was going on, but every once in a while someone threw out the “pocket goblin” I rolled a thing, and there were cheers. Handwavium made tolerate the baby sister less chore and more improbable chance saves you from a grisly death. Pocket goblin is strong against Normal and Fighting type Pokemon. So I got into roleplaying when I played a one on one game with my Dad (Powers and Perils, I don’t even think it exists to most gamers) and was intriqued by the big, self bound, three ring binder containing the rules. Finally played, it was a one shot because my Dad was too busy with work to do more. Then I started playing in highschool and now I’m living alone with my boyfriend and my KID BROTHER starts asking me about D and D. I’m filled with glee, he knows I play tabletop games and he wanted to play. So he’s been playing for a month now, and he wanted to try the Dragon Age roleplaying game so we’re playing that tomorrow. His highschool has a teacher who agreed to DM a game for him and his friends, most of which I taught the game. He said, and I quote “The newb (A kid I hadn’t taught) almost got us killed. That’s how you must feel when you started playing with us.”. As if he’s an experienced role-player after a month. Hehe. Right now it’s just lots of combat and dice rolling, but I’m slowly introducing them to the backstory and the rich character development and shenanigans of non-combat encounters. How do you go about introducing “backstory and rich character development” to new hack-n-slash types? What’s you go-to social encounter? Go to social for introducing them to social encounters is usually the “case the town” to find out info about where they are going. I give slight prods towards their character’s strengths (Hey, you’re a huge guy with horns, why not try intimidating that dock worker to get the info you need?). Eventually they learn to play to their strengths and I bring in more high intensity social encounters by bringing their backstory back up. I usually make them do a physical description of their character, and then I work with them to create a backstory, usually go improv rules “So your character was banished from his clan AND…?”. I also have everyone deliver me a secret that they don’t want anyone to find out, and introduce game situations that risk exposure of the situation and brings previous elements of their backstory back up. So the brother they thought they killed is now alive and after them for revenge, or the treasure that they stole from a powerful noble has earned them a bounty or some other such thing. I was actually SUPER impressed with one of his friends, who draws out of game, tying in his artwork with his character (An amnesiac) and only remembering that his character was an artist. I created an interesting item for him (A great sword called the War Brush with some neat extra powers) and it also gave him some memories back because the sword belonged to him. I’m actually SURPRISED that they take to role-play so well, but I do have the problem of them wench hunting in taverns every-time we stop. Ahhh adolescence. Ye olde wench hunt. There’s a reason for the, “Are there any girls there?” schtick. I’ve already spoken about my first ever RPing with the elf wizard that got PKed because Science Jokes and didn’t cast Air Walk when he should have…and yeah, that was my older cousin and his group of friends. I’d made about a bazillion characters before that because I liked building characters and thinking about what they’d do. And then I was in the Air Force and out of nowhere I get a knock on my dorm room, and it’s the dorm chief saying he heard I was a gaming kind of guy and would I like to get into a Vampire: The Requiem game he was planning on running. Thus began my first actual foray into campaigns and roleplaying at large, as a Mekhet who stole accidentally a flashbang grenade. I imagine it must be ever so slightly intimidating gaming with superior officers. Fortunately, he was only slightly superior, and we hit it off pretty well for the next couple years that I was in. Excellent DM, too. I’ve sort of had 3 “introductions” to DnD/Pathfinder. The original was my brother introducing me to 3.5 in my preteens. Of course, there were only the 2 of us, so it never really got past basic character design, and I had no clue how even that actually *worked* back then. Second is when I’m about 20 or so, and I’m introduced to Pathfinder for hte first time. First character was for the Carrion Crown AP from Paizo, so I bring a Dhampir fighter to the show. One of my two feats is Catch Off-Guard because (or so my mind provided) you never know when you might need to beat someone silly with a chair leg or other unorthodox item (an actual question I asked was whether a candlestick ‘borrowed’ from the Church would deal Holy damage.) I proceeded to initiate the first fight with a failed Intimidate, almost rip a guy’s throat out while the rest of hte party goes for nonlethal, and otherwise have a blast. Unfortunately, that game fell apart before we hit the first real dungeon. My final “first time” was the first campaign I was in that actually went anywhere. Actually no more than a week or two after CC fell apart, this time it was Curse of the Crimson Throne, and this time I’m a Kitsune Rogue… with a Katana it would take me several levels to get proficiency with, and no clue how sneak attacks work. Nothing like charging the first boss, alone, with a non-proficient weapon, abandoning all pretense of surprise. I got better though. 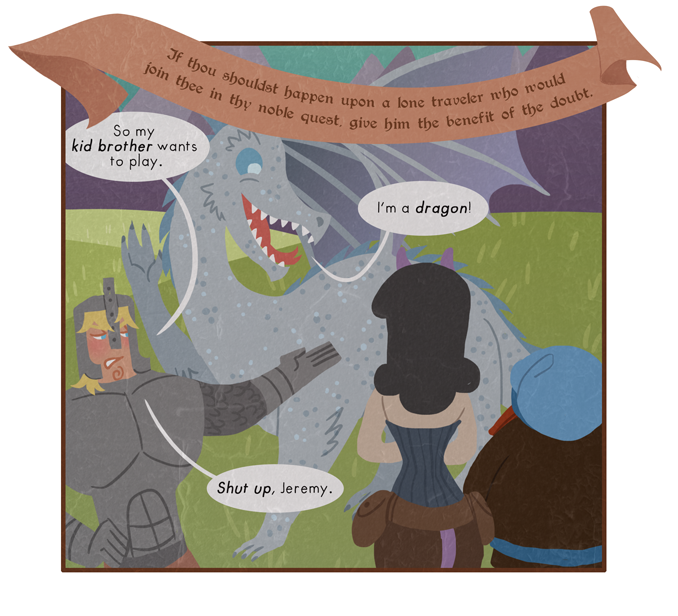 As far as playing a Dragon though, there’s one guy in my group who forever wants to play a Dragon. He actually has a running list of GMs that would let him do it. Despite what it says in today’s comic, my experience is actually pretty similar. I had the abortive high school games (see the Dragon Ball Z story over here: http://www.handbookofheroes.com/archives/comic/railroad) and then fell in love with Werewolf: The Apocalypse in college. That was the first game I ever tried to run, but graduation cut the campaign short, and we only got ~8 or so sessions. After that I moved across the country, confining my gaming to M:tG until I met Laurel. After that the RPG bug finally stuck. highschool, my old D&D group has fractured (and things were getting too silly for my own taste). i settled to find another group. found one, people in theire 40s, thats a lil intimidating. They were playing a sandbox form of GURPS and while they werent mean or ill-intended, they werent very helpful. It went about as well as you’d imagine. PRO : i got to play as an awakened dire tiger. Hey, one man’s signpost is another man’s railroad. I find that I enjoy the concept of Pathfinder Adventure Path play quite a bit. There’s enough space in the narrative to build in character backstory, but there’s always enough plot to keep things moving. Oddly… neither more or less. My first D&D experience was myself and a few friends going “well, we’re geeks already and hey one of us got some 2nd edition books so… let’s figure this thing out”. Our characters were… pretty weird and probably the sort of thing that would make me groan now, but we had some fun and figured out basically how that roleplaying thing was done. Not much came of it though. Just two really short campaigns then nothing till High School. Where I met some people with more roleplaying experience but being high school I was still certainly more experienced than the majority of the people we were playing with. It also “helped” that for the most part we didn’t stick with any system for more than a few sessions and we were constantly making our own homebrew systems. I mean, that’d be like 100% cooler than real young Ramsus but… yes. Let’s go with that. Close as any portrayal of people in media is likely to ever get anyway. Man that show. So good. So nostalgia. Mmmm. I can’t exactly remember. I think I was playing some kind of half-ogre? The only solid memory was a magical item we got. The Cloak of the Bat-ah-ah-achoo! Which transformed you into a bat when you sneezed. Wait… Was this punny setting called Xanth? Did you ever have to drink BootRear? Did you ever have to save Hugh Manatee? And now I’m out of the group. Crap. Later in the dungeon we came upon a body of a local villager. The DM described how it had two holes in the throat and since I had cut my teeth on horror movies and Stephen King novels (Salem’s Lot in particular) I said ‘Vampire for sure, we’d better put a stake though its heart or we’ll be fighting it later!” The other players looked a little surprised but we did it and sure enough we ran into the master vampire later on, but we didn’t have to fight that one! Fourty years later and we’re still fighting vampires. Who doesn’t love the classics! p.s. Laurel’s dad was in his 50’s, all the rest of us were in our 40’s then! So what was Ravenloft like as a 6-year-old? Roughly three-quarters of a year ago is when I first started getting into tabletop, because I’ll be DMing a group of friends’ steampunk sky pirate adventure, which will be heavily modified Pathfinder. I basically devoured the PFSRD in a matter of months. My first time actually playing (albeit 3.5) was with Doctor Asklepio five months ago in a skype-and-text campaign using Tabletop Simulator, in which I really was the little kid. They were all substantially older than me, much more experienced, and were super kind and helpful too. My first Pathfinder adventure started a month ago on the PbP bit of the Paizo forums, a Mists of Mwangi PFS adventure with The Gardener: Hobbit of Justice and his tree familiar Mister Trelawney. It’s a blast, even if he’s very very weak right now. My first time DMing was last week, a one-on-one session with a more local friend who had a go DMing me too. That featured her Valentina the Fortune Teller and my Daedus the Gladiator. That was her first time ever seeing Pathfinder in action, and she was brilliant as player… and also DM. Really mastered the idea of balance between railroading and sandboxing on her first try too, although she fudged the rolls a lot because she didn’t really understand how that worked yet. I guess she’s just got that natural talent for it, though I’ll be handling the DMing duty at least until she knows how to work modifiers. Why thank you! If I ever stoop to the railroad, my players have free reign to blow up the boiler. We were playing Call of Cthulhu at our gameclub, and this girl comes up and explains she has heard of RPG but never played one yet. So, as we just started on a module, we sat her at the table, and explained this whole RPG thing. And within 5 minutes it was clear that she “got it”. Here’s why: We suspected the police constable of the village knew something. And the GM (sorry: Keeper of Arcane Lore) had hinted that this constable was very interested in my character, the lady Doctor. So the new girl (playing a guy) says: Just send the Doctor to him so she can get all the info that we need. Which was indeed what happened, although my lady character had to use her purse on the man, to prevent being raped, after he had told her what she wanted to know…. So that is how I met my wife: when she was playing a he, and I was playing a she. There are few romantic prospects for the lonely geek. Rolling dice, reading fan fiction, waiting in line for the latest comic book movie… it all takes time. And mostly you’re content with your lot in life. You hang out with your geek friends, eat Doritos, drink Mountain Dew, and argue about whether Darth Vader could beat up Gandalf. But it’s not enough. You surround yourself with distractions and entertainments, play all the video games, surf all the websites, and wonder what else there is in life. And deep down, you know what it is. There’s that one moment you hope for. That special moment shelved away in the fantasy section of your heart, so impossible because after all, you’re a geek. She’s never going to walk through that comic shop door. She’s never going to look at you and smile; never going to share your interests and your inside jokes. You’re smart and you’re rational, and you know that the girl doesn’t exist. Except that one day in the fall of 2008, it happened to me. I was in the comic shop here in Cheyenne. I had a hand full of magic cards, a distinct lack of romantic involvement, and an empty afternoon stretching before me. But the door opened. The most beautiful girl in the world walked in, all dark hair and bright smiles, and I thought that I had wandered into a dream. But she was real. She asked the shop keep about local gaming groups. I promptly conceded my card game. That first month we were only friends. We played a few games together, fell in with the same social circle, and grew to like each other. And one night, walking out from that same comic shop, I asked her for a date. She said yes. And the rest, as they say, is history. If she hadn’t handed me a box full of dice last October — each one of which said “Will you marry me?” on it — I would have asked her before the year was out. I wish we could all be geeks in love. There is no finer feeling on this or any other world. Also we introduced our kids to role-playing, by making first the one, and then the other a squire to one of the player knights in my Pendragon campaign, when they turned 9. Well that’s adorable. Were they full PCs, or was it more of an honorary title? They started out as full squire PC’s. In Pendragon you usually play a knight, who starts his career at about 20, when his skills are sufficient to survive a fight. But before that he was a squire, which is a knight in training. So skills are less, and the squire is also required to wait on his knight. For the kids it was a way to learn about the game. See how the knights do their stuff, and then being asked to do some tasks for their knight, as that knight is too busy to do it himself. That’s when they had to play the game thenselves, and make their own decisions. Scary stuff for a 9-year old, but also very good for their problem solving and social skills. And they loved it! You know, I’ve always wanted to do an asymmetrical “Fellowship of the Rings” type game. Half the players are hobbits and half are big bad rangers and dwarves and similar. I wonder if this could be the way to pull that off? I like dragons sooooo much..
Ooh… I got bad news for you on the next page. I got into D&D after several years of ‘trying’. Basically, a youth group I used to go to made several attempts over a few years to set up a D&D group, or a Pathfinder group on one occasion. Every time, it fell apart before even the first session. A couple of years ago, I decided to take matters into my own hands and bought the D&D 5e Starter Set. In hindsight, my very first time playing shouldn’t have also been my first time DMing, even if we were using the Lost Mines of Phandelver module. We couldn’t even finish the first encounter. Towards the 2nd half of last year, I began using Roll20 and Discord with some friends (2 of which had a few years experience already), and we tried a few systems that never really went that far. Around the start of this year, we tried D&D with the Lost Mines of Phandelver module again. Our DM was significantly better, and we’re now done with the module, and a few sessions into a homebrew campaign. This has always been a social game. In my experience, learning from veterans is a load easier than learning from a book. Happily, the advent of podcasting has helped to ease that transition for newcomers. That’s part of the reason you see so many Critical Role fans these days. I was at a convention. I was bored and had nothing to do for an hour so I thought I might try some D&D for the very first time. The D&D tables were all few but I was directed to a Pathfinder table. The GM gave me a pre-gen character and once a few other people had come by, started the game. The guy was hilarious, doing voices for the various NPCs. A year later, I was at the next convention and went back to the tables. Once again, I had a lot of fun. When I got home, I started looking up ways I could play more often. I found Roll20 and began my first full game with my first customized character. Been playing ever since. Nice! One of the advantages of older editions is that you’ll find experienced GMs and players. Long-running fandoms are cool like that.